Bridges are some of the best fish habitats worldwide. 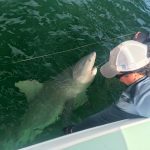 Like an oil rig attracts fish offshore, similarly bridges attract everything from baitfish and crustaceans to apex predators. Tampa Bay is home to four of Florida’s largest bridges including the state’s second largest, the Sunshine Skyway. Along with the 4 major bridges that span Tampa Bay are numerous smaller bridges that connect residential areas. Bridges are favorite hangout spots for fish for a multitude of reasons. They provide structure much like a reef or wreck which fish use to feed, hide, spawn, and rest from strong currents. Last week while on charter, I was idling under a small residential bridge and a client of mind asked me, “What kind of fish can you catch around bridges?” I thought to myself for a second and then chuckled. I told him that I was trying to think of a local species of fish that I haven’t caught around a bridge. At some point during the year bridges are home to virtually all species of fish that call Tampa Bay home including snook, redfish, trout, snapper, grouper, sheepshead, flounder, pompano and the list goes on. Our bridges are also major highways for more migratory species like mackerel, tarpon, cobia, and sharks. As a kid growing up on the bay I was always a bit intimidated by the prospect of fishing our bridges. I would think to myself, “They are so big, how am I ever going to find out where the fish are hiding?” While that concern has some validity, here are a few keys mother nature gives us to help hone in on where the fish are. Current: Positioning yourself up current allows you to drift your baits back to the structure. Fish also use breaks in the current as ambush points. The down current side of any large piling is a good place to look for feeding fish. Conversely, you can cast freelined baits underneath and up current of the bridge and let it drift back naturally. Shadow Lines: Shadow lines are used by almost all bridge predators to ambush baits. Bait will sit on the shadow line, typically right on the shadow side, and gamefish will move up and down the bridge feeding on unsuspecting baits. Bait and Birds: Wherever you find bait, know that gamefish are not far from it. Nervous bait schools or bait being chased on the surface is a dead giveaway that gamefish are nearby. If you consistently see bait hanging around one piling or bumper, that is probably a good place to start prospecting. Birds are also a good indicator of where the action is. Even when birds are not feeding, they can still help guide you to the action. Pelicans especially, will not fly far from their last meal or far from where they think their next meal will come from. If you see a school of pelicans consistently hanging out or working a certain area of the bridge it’s probably safe to say there is bait and gamefish in that area as well. Another great way to find concentrations of fish around a bridge is to use you fishfinder/bottom machine. I still run my machine up and down the bridge from time to time. Slowly running in and out of bridge stalls and pilings while keeping a keen eye on your bottom machine is a great way to identify where fish are hanging out. I recommend getting out to the bridge at slack tide before peak fishing time and spend some time locating potential hot spots to fish once the tide starts to move and the bite turns on. Even the smallest piece of hard bottom, rock, or change in bottom contour can be productive once the tide starts to move. 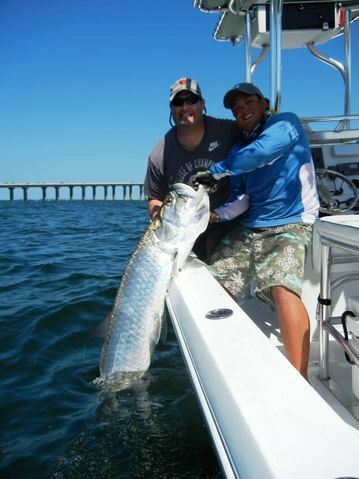 Bridges in Tampa Bay are a surefire way to catch fish no matter what month of the year, but late spring and early summer is about as good as it gets when targeting many of our year round and migratory bridge dwellers. Remember to be courteous of other boaters as well as the land locked bridge fisherman.